Mechanics of bipedalism suggest dinosaurs had to be warm-blooded. Or: Why the aerobic capacity model needs to be retired. The old "cold blooded or warm blooded" argument once again rears its ugly head. This post has taken an inordinate amount of time to write up. Mostly because it required finding enough free time to sit down and just type it out.� So I apologize ahead of time for bringing up what is obviously old news, but I felt this paper was an important one to talk about, as it relied on a old, erroneous, but very pervasive, popular and rarely questioned hypothesis for how automatic endothermy (mammal and bird-style “warm-bloodedness”) evolved. Pontzer, H., Allen, V. & Hutchinson, J.R. 2009. Biomechanics of Running Indicates Endothermy in Bipedal Dinosaurs. PLoS ONE.Vol 4(11): e7783. Using muscle force data for the hindlimbs of theropods, and applying it to a model based on Pontzer (2005, 2007), the authors were able to ascertain the approximate aerobic requirements needed for large bipedal theropods to move around. Their conclusion was that all but the smallest taxa had to have been automatic endotherms (i.e. warm-blooded). Time to stop the ride and take a closer look at what is going on here. In 2004, John Hutchinson – of the Royal Veterinary College, London UK – performed a mathematical study of bipedal running in extant taxa. He used inverse dynamics methods to estimate the amount of muscle that would be required for an animal to run bipedally. He then tested his models on extant animals (Basiliscus, Iguana, Alligator, Homo, Macropus, Eudromia, Gallus, Dromaius, Meleagris, and Struthio). The predictive capacity of his model proved to be remarkably substantial and stable (Hutchinson 2004a).� A follow up paper in the same issue (Hutchinson 2004b) used this model to predict bipedal running ability in extinct taxa (Compsognathus, Coelophysis, Velociraptor, Dilophosaurus, Allosaurus, Tyrannosaurus and Dinornis).� Results from this study echoed previous studies on the running ability of Tyrannosaurus rex (Hutchinson & Garcia 2002), as well as provided data on the speed and agility of other theropod taxa. Meanwhile in 2005, Herman Pontzer – of Washington University in St. Louis, Missouri – did a series of experiments to determine what was ultimately responsible for the cost of transport in animals. To put it another way: Pontzer was searching for the most expensive thing animals have to pay for in order to move around. One might intuitively assume that mass is the ultimate cost of transport. The bigger one gets, the more energy it requires to move a given unit of mass, a certain distance. However experiments on animals found the opposite to be the case. It actually turns out that being bigger makes one “cheaper” to move.� So then what is going on here? Pontzer tested a variety of options for what could be happening; from extra mass, to longer strides. In the end Pontzer found that the effective limb length of animals, was ultimately the limiting factor in their locomotion. 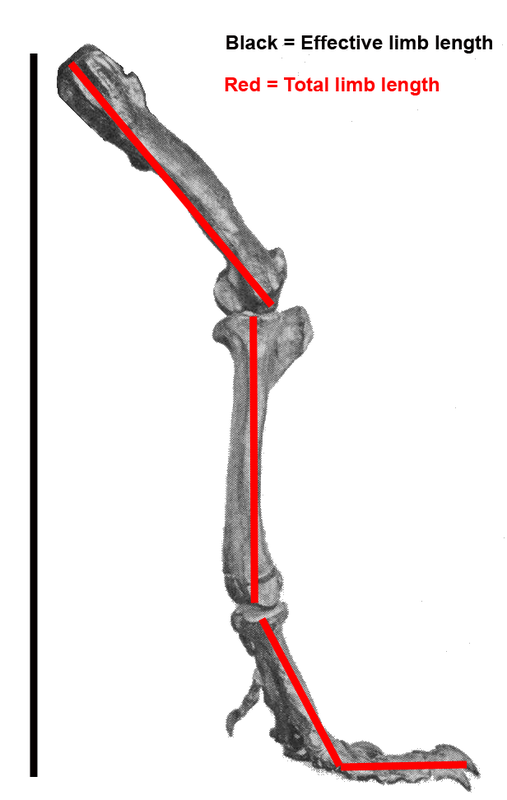 Effective limb length differs from the entirety of the limb. Humans are unique in that our graviportal stance has us using almost our entire hindlimbs. Most animals, however, use a more crouched posture that shrinks the overall excursion distance of the hindlimb (or the forelimb). By taking this into account Pontzer was able to find the one trait that seemed to track the best with cost of transport in animals over a wide taxonomic range (essentially: arthropods – birds). This latest study combines these two technique in order to ascertain the minimum (or approx minimum) oxygen requirements bipedal dinosaurs would need in order to walk, or run. We focused on bipedal species, because issues of weight distribution between fore and hindlimbs make biomechanical analysis of extinct quadrupeds more difficult and speculative. The force plate work cited is for quadrupedal mammals. However, mammals are not reptiles. As Nicholas Hotton III once mentioned (1994), what works for mammals, does not necessarily work for reptiles. This is especially so for locomotion. The last problem is by far the largest, and ultimately proves fatal to the overall conclusions of the paper. The authors operated under the assumptions of the aerobic capacity model for the evolution of automatic endothermy. It is here that we come to the crux of the problem, and the main subject of this post. Man made mechanical engines produce heat,and some produce enormous amounts of it, but no one would make the mistake of thinking that this was what they were designed for. Heat is a by-product – sometimes useful, sometimes a nuisance, of an engine’s prime function, which is to turn the chemical energy contained within fuel into some sort of motion. The proposal by Bennett & Ruben was that the high metabolisms of birds and mammals, are there to power their “aspirated engines.” That is to say, their high metabolism is in place to confer greater aerobic capacity. The creation of heat is simply a byproduct that mammals and birds evolved to take advantage of . There have been a number of hypotheses put forward to explain the evolution of automatic endothermy in birds and mammals. They have included everything from assuming that being hot all the time is a natural progression for life (“hot is good”), to assuming that high metabolisms allow for the evolution of larger brains, and more complex behaviours. Currently there are three major hypotheses for how automatic endothermy evolved. Of these three, it is the aerobic capacity hypothesis that has received the most favour. It appears to come with some degree of intuitive understanding to it. Bennett & Ruben observed that mammals and birds appeared more active than similar sized reptiles. The former are “warm-blooded” while the latter are not. Perhaps, then, being “warm-blooded” allows critters to be more active. Further, according to Bennett & Ruben, the factorial scope, or the maximum oxygen powered ability of animals seems locked at between 5 – 10 times their resting metabolic rate.� Theoretically then, if one had a high resting metabolic rate, then one would consequently wind up with a higher maximum oxygen capacity. This would allow animals to embark on long distance runs, or to get into aerobically intensive battles over food and mates. The whole thing would wind up in a positive feedback loop, where increased aerobic capacity lead to higher metabolic rates, until eventually one would get an automatic endotherm from a bradymetabolic “cold-blooded” ectotherm. For their example Bennett & Ruben used the estimated rate of oxygen consumption with speed for a green iguana an an equivalent sized mammal. Since then there have been numerous similar studies that have shown the existence of a broad (but weak) correlation (Hayes & Garland 1995). 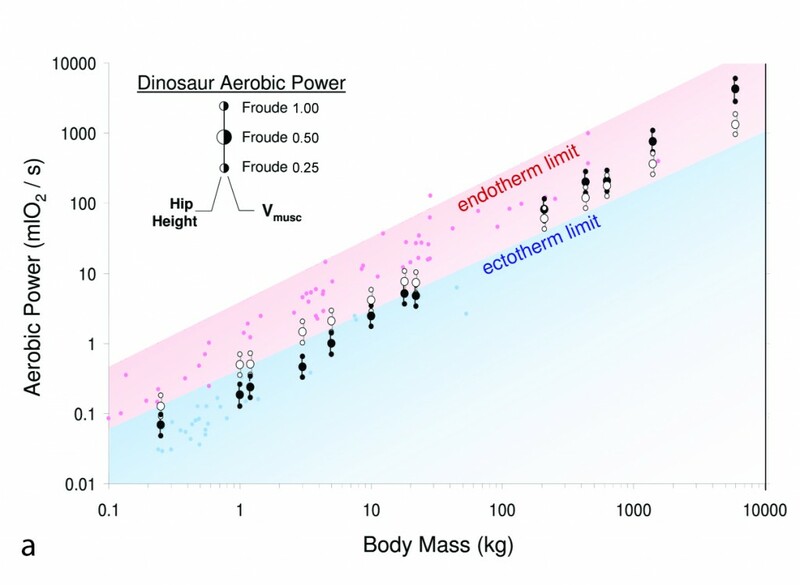 Graph of aerobic power requirements of the dinosaurs studied, compared to known max O2 consumption rates for automatic endotherms and "ectotherms." From Pontzer et al 2009. There are significant problems with the aerobic capacity hypothesis; not the least of which is the ease with which it was embraced by the scientific community.� Though there have been occasional studies that have attempted to test this model (few of which, validated it), it has for the most part received widespread appeal, and is often accepted as the default hypothesis for how automatic endothermy arose. Indeed, Pontzer et al cite this hypothesis as just so in their paper. and thus much of our understanding of dinosaur paleoecology and evolution hinges on this critical distinction. Another problem with the aerobic capacity hypothesis is the fact that the anatomy & physiology don’t agree with it. Aerobic exercise is powered by the heart, lungs and skeletal muscles. However, the heat that is generated in automatic endotherms, and is what is ultimately responsible for their high metabolic rates, comes from “leaky” Na+/K+ pumps in the cell membranes of the viscera (liver, intestines etc.) . These are two different systems at work here. Is there any causal link between the two? Bennett & Ruben believed so, and suggested that this increase in skeletal and heart muscle must have incurred a maintenance cost.� However, in the 30 years that this hypothesis has been in use, no physiological link has ever been found. In fact, as we shall see shortly, there is actually an ample amount of evidence to suggest that no such link exists. The other major flaw with the aerobic capacity argument is in the assumption that maximal rates of O2 are somehow linked to resting O2 levels. As I just mentioned, these are two separate systems at work here. Thus there should be no reason why maximal aerobic scope should rely on resting oxygen rate. Indeed, studies over the past three decades have falsified the initial assumption that O2 rates are held fast at between 5-10 times resting rate. In reptiles to date, maximum aerobic scope has been found to be between 5 – 40 times resting rate (Bennett 1982, Beck et al 1995, Watanabe 2005). Data on mammals has found aerobic scope to be as high as 60 times resting rates (Weibel et al 1992); as seen in wolves and wild dogs, while data on flying insects blows everything else away with flight metabolism in bradymetabolic insects (house fly) getting as high as 100 times the resting metabolism (Davis & Fraenkel 1940). Another observation that one would predict from the aerobic capacity model, is that animals trained to enhance their maximal O2 consumption, should show a concomitant increase in their resting metabolic rate. However, data gathered from exercise studies on animals has not shown this to be the case.� Human studies in particular, have found that exercise training can significantly increase one’s maximal aerobic scope without affecting the resting metabolic rate (Bingham et al 1989, Schulz et al 1991, Wilmore et al 1998). If conditioning the body has no affect on resting metabolic rate, then perhaps the aerobic capacity model says more about the phenotype you were born with. Perhaps this alleged link has more to do with one’s innate endurance capacity, rather than the one that exercise can achieve. Well� data on laboratory mice bred specifically to have higher maximal O2 rates,� also did not find an increase in resting metabolic rate (Konarzewski et al 1997). Recent studies of the molecular pathways of automatic endothermy in mammals and birds has uncovered similar results, with the “leaky cell membranes” responsible for creating heat in the bodies of birds and mammals, resulting in an increased energy demand, rather than providing extra energy availability (Walter & Seebacher 2009). Ultimately it is this dearth of empirical data in support of the aerobic capacity model, coupled with numerous lines of counter-evidence, that winds up undercutting the conclusions of the Pontzer et al paper. … it might be proposed that extinct dinosauriforms were ectothermic, but were able to achieve a greater VO2 max than modern reptiles. While the respiratory physiology of dinosaurs has been the subject of much debate, the latter proposal would require an aerobic scope (VO2max/RestingMetabolicRate) for the five largest species in our sample of 30�90x resting rate, far exceeding the maximum aerobic scope in our sample of modern ectotherms (14.5) and even greater than the aerobic scope of most mammals (mean12.9611.0 S.D.;max61.9;seeTableS2). While not exactly the racehorses of the lizard world, helodermatid males have been observed wrestling wth each other for several hours. A considerable effort, that requires a high aerobic capacity. Besides relying on the erroneous assumption that maximal and resting metabolic rates are linked, what strikes me as most odd in the conclusion paragraph is that their sample size for aerobic scope in bradymetablic reptiles has at its highest, a value of only 14.5 times resting metabolism. This is far from the known values of extant bradymetabolic reptiles. For instance Thompson & Withers (1997) found a maximal aerobic scope of 35 times resting rate in the varanid: Varanus caudolineatus, while Beck et al (1995) found the aerobic scope for helodermatid lizards to be 30.4 times higher than resting rates; a value so high that it was considered worthy of pointing out in the abstract. The Beck et al work is particularly interesting, for it turns out that this work on Heloderma was actually cited in Pontzer et al’s supplementary material. However the data that they cite� is incorrect. In fact the supplementary data from Pontzer et al for Heloderma disagrees considerably with the work it cites. They cite a resting metabolic rate of 0.0212 mlO2/s for a 557 gram animal, but the data from Beck et al is from a 500 gram individual with a resting metabolic rate of 0.00485 mlO2/s; a 400% difference! I find this very disconcerting, and hope that it was just a simple error on the authors’ part. To summarize: the model of Pontzer et al on the oxygen consumption rates needed for walking and running in theropods, is interesting and has potential use in reconstructing dinosaur activity patterns, and functional limits. However, the assumptions that the authors take, regarding oxygen consumption rates and their relationship to resting metabolic rate, is flawed. This flawed assumption that activity levels say anything about underlying thermophysiology is not unique to this paper, but is a consistent trend seen in most metabolic reconstruction studies (e.g.. Paul & Leahy 1994, Seymour et al 2004). It’s about time that it stopped. The intrinsic appeal of the aerobic capacity model has no doubt allowed it to survive as the dominant explanation for the evolution of automatic endothermy for the past 30 years. However, the lack of data in support for this model, and the ever increasing amount of evidence to the contrary, suggests that this model is really more of a “good story” than it is a valid scientific hypothesis. There are other, better supported hypotheses for the evolution of automatic endothermy (McNab’s thermoregulation hypothesis & Farmer’s parental care hypothesis). It’s about time that they received more attention. As for the aerobic capacity model; it has been running on fumes long enough. I say it is time we retired this hypothesis for good. Bennett, A.F. 1982.The Energetics of Reptilian Activity. In: Gans, C. and Pough, F.H. (eds).Biology of the Reptilia. Vol.13, Physiology D, Physiology and Ecology. London Academic Press.pp.155�199. Bennett, A. and Ruben, J. 1979. Endothermy and Activity in Vertebrates. Science. Vol.206:649-654.
on Basal Metabolic Rate. Br.J.Nutr. Vol.61:155�173. Davis, R.A. & Fraenkel, G. 1940. The Oxygen Consumption of Flies During Flight. J.Exp.Biol. Vol.17:402-407. Hayes,J.P.& Garland, T.G. 1995.The Evolution of Endothermy:Testing the Aerobic Capacity Model. Evolution. Vol.49(5):836�847. Hutchinson, J.R. 2004a. Biomechanical Modeling and Sensitivity Analysis of Bipedal Running Ability. I. Extant Taxa. J.Morphol. Vol.262:421-440. Konarzewski, M., Sadowski, B., Jozwik, I. 1997. Metabolic Correlates of Selection for Swim Stress-Induced Analgesia in Laboratory Mice. Am.J. Physiol.Regul.Integr.Comp.Physiol. Vol.273(42):R337�R343. Paul, G.S. & Leahy, G.D. 1994. Terramegathermy in the Time of the Titans. : Restoring the metabolics of Colossal Dinosaurs. Paleo.Soc. Special Publication. Vol.7:177-198. Schulz, L.O., Nyomba, B.L., Alger, S., Anderson, T.E., Ravussin, E. 1991.Effect of Endurance Training on Sedentary Energy Expenditure Measured in a Respiratory Chamber. Am.J.Physiol. Vol.260:E257�261. Thompson, G.G. & Withers, P.C. 1997. 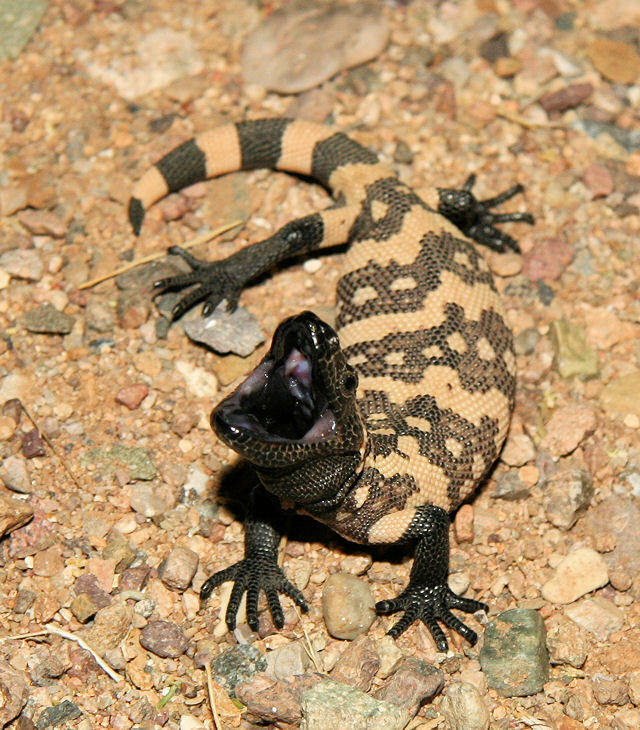 Standard and Maximal Metabolic Rates of Goannas (Squamata: Varanidae). Physiological Zoology, Vol. 70(3):307-323. Walter, I. & Seebacher, F. 2009. Endothermy in Birds: Underlying Molecular Mechanisms. J.Exp.Biol. Vol.212:2328-2336. Watanabe, M.E. 2005. Generating Heat: New Twists in the Evolution of Endothermy. Bioscience. Vol.55(6):470-475. Resting Metabolic Rate as a Consequence of 20 wk of Endurance Training: The� HERITAGE Family Study. Am.J.Clin.Nutr. Vol.68:66�71. 5 Responses to Mechanics of bipedalism suggest dinosaurs had to be warm-blooded. Or: Why the aerobic capacity model needs to be retired. Well-researched post! PLoS ONE allows readers to add their comments, observations, and suggested corrections to the articles published there. If you are so inclined, I would recommend doing so either with your full blog post or a few selected points from above. This way your concerns with the paper will be available to a broader audience (and the authors may even respond in the same forum, as they are encouraged to do). – Andy Farke (section editor of paleontology for PLoS ONE. Thanks for the advice Andy. I agree that would be a good idea, and I think I will do that. I like PLoS ONE’s open access, community oriented ideals, and would like to encourage it. Excellent! Just as a heads-up, PLoS requires “real” names rather than pseudonyms for comments. If this is a problem for you, I would be more than happy to post a link on your behalf. Great post. I likewise am disturbed at how the aerobic capacity hypothesis has been so widely endorsed, when it is so under-supported by data. This is why I love this blog – Jura unapologetically slays excepted dogma with a cold, hard facts. Absolutely magnificent.